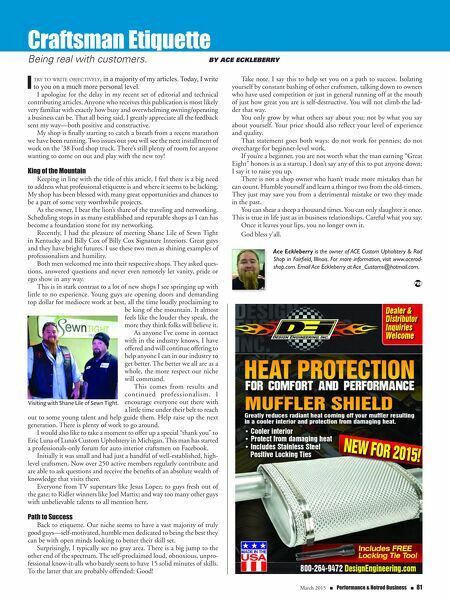 March 2015 n Performance & Hotrod Business n 81 I try to write objectively, in a majority of my articles. Today, I write to you on a much more personal level. I apologize for the delay in my recent set of editorial and technical contributing articles. 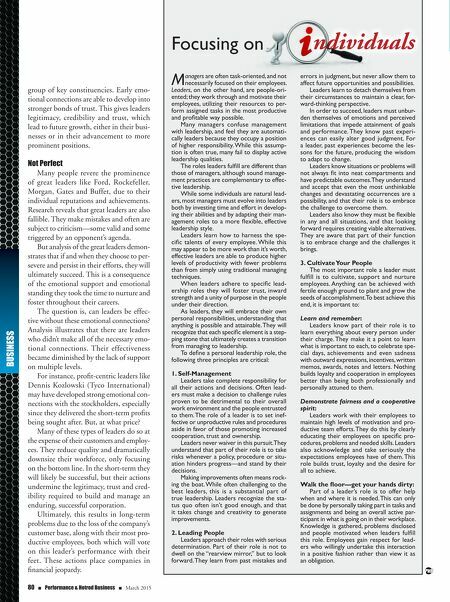 Anyone who receives this publication is most likely very familiar with exactly how busy and overwhelming owning/operating a business can be. That all being said, I greatly appreciate all the feedback sent my way—both positive and constructive. My shop is finally starting to catch a breath from a recent marathon we have been running. Two issues out you will see the next installment of work on the '38 Ford shop truck. There's still plenty of room for anyone wanting to come on out and play with the new toy! King of the Mountain Keeping in line with the title of this article, I feel there is a big need to address what professional etiquette is and where it seems to be lacking. My shop has been blessed with many great opportunities and chances to be a part of some very worthwhile projects. As the owner, I bear the lion's share of the traveling and networking. Scheduling stops in as many established and reputable shops as I can has become a foundation stone for my networking. Recently, I had the pleasure of meeting Shane Lile of Sewn Tight in Kentucky and Billy Cox of Billy Cox Signature Interiors. Great guys and they have bright futures. I use these two men as shining examples of professionalism and humility. Both men welcomed me into their respective shops. They asked ques- tions, answered questions and never even remotely let vanity, pride or ego show in any way. This is in stark contrast to a lot of new shops I see springing up with little to no experience. Young guys are opening doors and demanding top dollar for mediocre work at best, all the time loudly proclaiming to be king of the mountain. It almost feels like the louder they speak, the more they think folks will believe it. As anyone I've come in contact with in the industry knows, I have offered and will continue offering to help anyone I can in our industry to get better. The better we all are as a whole, the more respect our niche will command. This comes from results and continued professionalism. I encourage everyone out there with a little time under their belt to reach out to some young talent and help guide them. Help raise up the next generation. There is plenty of work to go around. I would also like to take a moment to offer up a special "thank you" to Eric Luna of Luna's Custom Upholstery in Michigan. This man has started a professionals-only forum for auto interior craftsmen on Facebook. Initially it was small and had just a handful of well-established, high- level craftsmen. Now over 250 active members regularly contribute and are able to ask questions and receive the benefits of an absolute wealth of knowledge that visits there. Everyone from TV superstars like Jesus Lopez; to guys fresh out of the gate; to Ridler winners like Joel Mattix; and way too many other guys with unbelievable talents to all mention here. Path to Success Back to etiquette. Our niche seems to have a vast majority of truly good guys—self-motivated, humble men dedicated to being the best they can be with open minds looking to better their skill set. Surprisingly, I typically see no gray area. There is a big jump to the other end of the spectrum. The self-proclaimed loud, obnoxious, unpro- fessional know-it-alls who barely seem to have 15 solid minutes of skills. To the latter that are probably offended: Good! Take note. I say this to help set you on a path to success. Isolating yourself by constant bashing of other craftsmen, talking down to owners who have used competition or just in general running off at the mouth of just how great you are is self-destructive. You will not climb the lad- der that way. You only grow by what others say about you; not by what you say about yourself. Your price should also reflect your level of experience and quality. That statement goes both ways: do not work for pennies; do not overcharge for beginner-level work. If you're a beginner, you are not worth what the man earning "Great Eight" honors is as a startup. I don't say any of this to put anyone down; I say it to raise you up. There is not a shop owner who hasn't made more mistakes than he can count. Humble yourself and learn a thing or two from the old-timers. They just may save you from a detrimental mistake or two they made in the past. You can shear a sheep a thousand times. You can only slaughter it once. This is true in life just as in business relationships. Careful what you say. Once it leaves your lips, you no longer own it. God bless y'all. Ace Eckleberry is the owner of ACE Custom Upholstery & Rod Shop in Fairfield, Illinois. For more information, visit www.acerod- shop.com. Email Ace Eckleberry at Ace_Customs@hotmail.com. Craftsman Etiquette Being real with customers. By Ace eckleBerry Visiting with Shane Lile of Sewn Tight.